Early detection and effective treatment provide the best chance of survival from breast cancer. And that’s what Komen San Diego is all about. 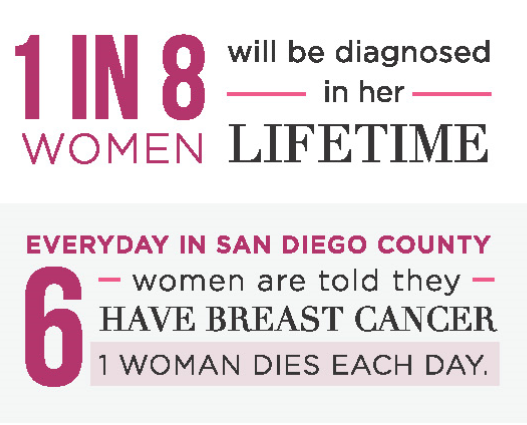 We provide the most critical services in San Diego County and invest in breakthrough research to prevent and cure breast cancer. Support our mission by participating in Dine Out for the Cure! In the last 6 years, local eateries have raised $120,000 which is equivalent to the cost of 300 ultrasounds, 321 mammograms and 150 breast prostheses for uninsured and underinsured women and men. Special thanks to our dedicated restaurant partners that have continued to support our mission each year through our Dine Out for the Cure program. Komen Supporters Dine Out on Oct. 17th! It’s simple. By eating at a participating restaurant, your meal will make an impact on the fight against breast cancer. Be sure to wear pink and let the restaurant know that you are dining out for the cure! Komen San Diego will provide you with all the necessary publicity materials and an e-communication tool kit to make your restaurants’ event a success! In order to participate, simply fill out the agreement and email it to dineout@sdkomen.org.